Like Barbara Vine’s A Fatal Inversion, reviewed on my own website, this is set mainly during the hot, hot summer of 1976, the stifling heat adding to the claustrophobic atmosphere of this unusual domestic mystery. The main narrator is a precocious and purposeful child, Grace Bennett, whose observations of adult behaviour and the goings in and out of neighbouring houses on a middle-class avenue give something of the flavour of a sitcom, like Are You Being Served? and The Good Life, both of which shape the weeks of Dorothy and Harold Forbes (the names, too, are redolent of constrained, conventional lives). But there are nasty stirrings beneath the respectability, as we gradually discover in the aftermath of a disappearance. Mrs Margaret Creasy, married to the apparently autistic John, has vanished without trace, and several residents of The Avenue have theories to air or secrets to hide. Ten-year-old Grace and her friend Tilly decide to devote the otherwise uneventful summer holidays to a search for both Mrs Creasy and God, who they trust will keep everyone safe. 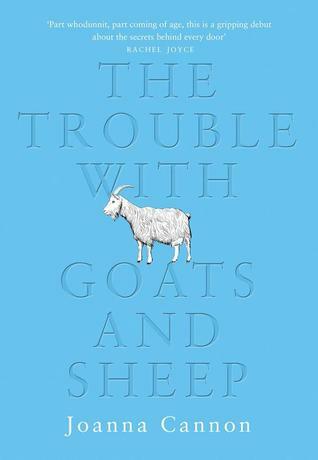 This sense of belonging or not-belonging is a central theme, indicated by the sheep and goats of the title. Grace, to Tilly’s disapproval, wants to emulate the clothes and mannerisms of teenage Lisa; a newly-arrived Indian family is treated with condescension; the neighbours, hardly plausibly, collaborate in a joint delusion that a creosote stain on a wall is the face of Jesus, assembling daily to pay homage to it. But at the chilling heart of the novel is the hardening of opinion against Walter Bishop, the lonely man viewed as ‘outsider’, and the gathering of something resembling a lynch mob as rumours accumulate. Neighbourliness gives way to ugly prejudice in scenes that call to mind Kristallnacht or the Ku Klux Klan; those characters uneasy about the rising hostility tend to be the quieter ones, whose misgivings are ignored by others bent on drastic action. The structure is ingenious, focusing our attention on the build-up to a tragedy. In 1976, the ‘present’ of the novel, we move through sweltering days towards the inevitable cathartic break in the weather, while in the past, nine years earlier, we begin on December 21st and work backwards. Known to various parties, the events of that decisive night are relayed to the reader in a succession of hints, while exposure and repercussions threaten. Each household, it seems, is hiding a secret; some shameful or even criminal, others touching. The author cleverly plays with our assumptions and sympathies, making us reassess the characters as the plot unfolds. In several ways this novel reminds me of Rachel Joyce’s The Unlikely Pilgrimage of Harold Fry. Both authors have a way of expressing insights with simple, poignant clarity: widower Eric Lamb reflects that “the past often broke into the present like an intruder, dangerous and unwanted. Yet whenever the past was invited in, whenever its presence was requested, it seemed to fade into nothing, and made you wonder if it had ever really existed in the first place.” The two novels share a kind of innocence and openness; in Harold Fry's case, in his impulsive decision to set off on his walk, trusting in chance and the kindness of strangers to sustain him; here, in the counterpointing of Grace and Tilly's speculations with adult guilt and sorrows. Joanna Cannon's ending, though, suffers from a last-moment deus-ex-machina revelation and a number of unanswered questions and improbabilities. If there’s such a thing as a Reading Group novel, this is it - in fact, that’s why I read it, as the September choice of a member of the group I'm part of. The Trouble with Goats and Sheep is an engaging page-turner, full of charm, its lightness of tone both highlighting the absurdity of adult behaviour and concealing sinister impulses beneath apparently ordinary lives. And, usefully for any discussion, it’s likely to divide opinion. The 1890s: a wealthy young widow moving to a new location; a village haunted by fear and superstition; sea-mists and strange effects of moonlight; experiments with hypnotism; the dread of tuberculosis; exchanges of letters to advance the plot - you might think you're in familiar territory here. But there is nothing hackneyed about Sarah Perry's handling of her materials. 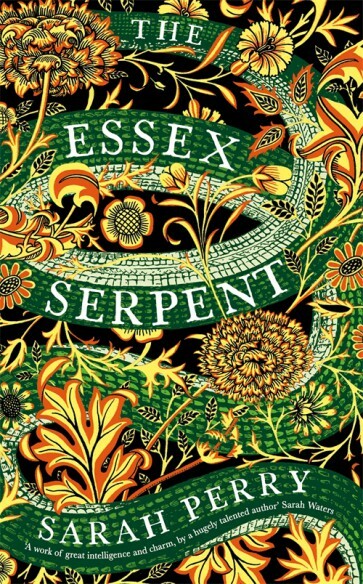 The Essex Serpent takes us through a year, mainly in a rural community near the river Blackwater in Essex, and partly in London. On the first morning of the year a naked drowned man is found at the river's edge, his neck oddly twisted; this tragedy sets rumours flying of goats killed in the night, inexplicable stirrings in dark water and supernatural punishments for collective guilt, all of which the local vicar tries to combat with reassurances and prayers. Sarah Perry's characters spring from the page. The reader is soon enamoured of Cora Seaborne; newly released from an unhappy and even abusive marriage, she is no victim, but an energetic, independent and fiercely honest woman with a passion for fossil-hunting, drawn to Aldwinter by the serpent rumours. Could it be a living fossil, an ichthyosaurus that has somehow survived into the modern age? (I've only recently read and reviewed Tracy Chevalier's Remarkable Creatures, whose heroine Mary Anning is frequently referred to here as an inspiration for Cora - viewed from the other side of Darwinism, as it were, more than fifty years after her astonishing finds.) Cora's free-thinking is matched by that of her companion, Martha, a socialist, who is acutely aware of class divisions and the inadequacy of London housing. In a recent Guardian interview, Sarah Perry said that she aimed for 'a version of the 19th century that, if you blinked, looked a little like ours. I wanted to write a version of the Victorian age that wasn’t a theme park of peasoupers and street urchins. The more I looked, the more I found that not a great deal has changed – an ineffectual parliament, the power of big business and the insecurity around housing. And contemporary Conservatism going back to this idea that morality and poverty are in some way linked.' Martha tells a wealthy acquaintance. "We are punishing poverty ... If you are poor, or miserable, and behave as you might well expect a poor and miserable person to behave, since there's precious little else to pass the time, then your sentence is more misery, and more poverty." She saw 'his wealth and privilege coat him like furs'. For all the novel's skilful plotting, with many well-drawn minor characters playing their part, the relationships seem to have the unpredictability of real life. Cora's experience of marriage has not inclined her to look for a new partner, yet she inspires love in at least three others, including the married clergyman Will Ransome. Although she and Will disagree on almost very point of faith and reason, he admires her as a sparring partner, and seeks her out for conversation. Cora's autistic son Francis, withdrawn, absorbed in his collections of strange objects, finds affinity with Will's consumptive wife and her obsession with the colour blue. Luke Garrett, a young surgeon who is central to the London part of the plot, is in love with Cora and quickly jealous of her affection for Will. 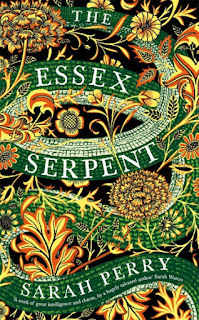 The criss-crossing of relationships - the children's as well as the adults' - keeps the reader guessing to the end, as does the question of whether the serpent really exists. I hoped it wouldn't - but no spoilers. And I shall certainly be looking out for noctiluminescence in late summer skies. There are many kinds of books in the world. Some, you quite fancy when you hear about them. Others you know you have no interest in at all. With a few you think: I'll wait for the paperback. And then there are the ones that you have to have the minute you read about them. In hardback. However expensive, and the sooner the better. On April 11th, 2015, I read Rachel Campbell-Johnston's review of THREADS by Julia Blackburn in the Times and I bought the book as soon as I possibly could. It was a volume I had to have in my possession, on my shelf at once, and when I got it, I dropped every other book that I was reading and started it immediately. To say this was a pleasure is an understatement. In every possible respect (production, paper, cover, illustrations, and above all the text itself) this book is a thing of beauty. You need to pick it up and touch the smooth pages and feel for yourself the heft and weight of it. More than anything else, though, it was the subject that drew me. I am interested in artists who have no training, and I love seascapes of every kind. Also, I am fascinated by embroidery in all its manifestations (see the History Girls post I wrote after a trip to Bayeux) and I support the charity Fine Cell Work who give male prisoners a chance to express themselves creatively and in the process find some measure of rehabilitation. When I read about John Craske, I was quite determined to go and see the exhibition that Julia Blackburn put together in Norwich. The book details her search through the obscurer parts of Norfolk to find out what she could about this amazing artist who spent much of his life in a small cottage first painting images of the sea on every imaginable surface and then embroidering the most astonishing art on to a piece of cloth stretched on to a frame. I'm afraid that I failed in this ambition and the illustrations in this post come from my amateur photographs of pages of my book. I went to the wrong place....the website was ambiguous to say the least and directed me and my companion on the trip, Helen Craig, to a place which was shut in a way that looked as though it had no hope of ever opening again. There was no poster advertising the exhibition anywhere in Norwich and the kind folk we asked at the Cathedral knew nothing about it.....I feel sad to have missed it, and will treasure my book even more. I live in hope that the exhibition, which finished too soon for me to revisit, moves to somewhere else. Craske, born in 1881, was a fisherman from a family whose lives were bound up with the sea. It was Craske's natural habitat and his whole life was spent on it, beside it and depicting it in paint and thread. He fell ill at the age of 36, and from then on, he described himself as being in a 'stuporous state.' From 1923 onwards, he painted the sea until he could no longer stand. The embroidery happened when painting became too difficult for him. Valentine Ackland, and her lover, Sylvia Townsend Warner, discovered him and championed him and that provided some money at least. Some people in the thirties (Peter Pears, for instance) were aware of him, and thought highly of him, and there is one newspaper cutting reproduced in Threads, but he never became fashionable, unlike his contemporary, Alfred Wallis of Cornwall. Craske's devoted wife looked after him. Her name was Laura and she cared for him till the end of his life. The review by Claire Harman in the Guardian provides a good overview of his life and a wonderful description of the book, and I do urge you to read it. I'm grateful to Sally Prue for pointing it out to me. Blackburn is a wonderful writer. Her account of how she looked for Craske and uncovered the details of his life reminds me very much of W.G.Sebald's Rings of Saturn. She doesn't stick to the main biographical thrust of the narrative but wanders in and out of many places, meeting strange people and seeing wondrous things. You want to make notes to prompt yourself to follow her on the journey she took. I have a whole notebook full of leads to chase up one day. Meanwhile, an exhibition in the gallery of Norwich University of the Arts is a good start to getting Craske's name to a greater public, though it's disturbing that so little sign of the show was visible in Norwich. This seems spookily of a piece with his invisibility throughout his life, and points to a flower that's born to blush unseen, but that's not quite true. I'm sure LOTS of admirers have visited the gallery and enjoyed his work first hand and the hope is that the word will keep spreading and that more people will become aware of this amazing and almost forgotten artist's life and work. By the end of Threads, you know about Craske, but you also know about Julia Blackburn. Her husband, the sculptor Herman Makkink, dies suddenly and she becomes a widow. The way she describes widowhood touched me very much. I felt she'd expressed much of what I felt when I lost my husband, in 2013. She was urged to go on working by her late husband, and it is the work, she says, which ensures that life goes on: that and the birth of a grandchild. Blackburn has gone on working in great style with this book about Craske, restoring some of her own life in the process of describing his. And I, because I missed the exhibition, went to the Cathedral in Norwich. Any readers of this blog will know I have a love of cathedrals and this one is beautiful. I was glad to have had the opportunity to see it. I also saw a terrific collection of teapots in the Castle Museum....that's something I'd never have found in the normal course of events, and I felt quite Julia Blackburn-like about the pleasure of bumping into unexpected things. On the train home from Norwich, Helen Craig took a most beautiful photograph of the sky, which is as interesting as the sea, and I'm putting it up at the end of this post for everyone to share. Please do not miss this book. The photo above shows the back of one of Craske's embroideries and, like the rest of his work, it's lovely. Threads is easily the best non-fiction book I've read in years and years: always accessible, never obscure, endlessly fascinating and full of the strangest and most unusual characters.